Manorama Year Books in English is India's most popular GK fact book. The Yearbook is extremely useful for students preparing for various Competitive and entrance exams. It is also useful for teachers, Researchers, Media persons and laypersons alike. It serves as an Up-to-date reference database covering varied topics like Science and Medicine, Space, Environment, Literature, History, 1000 Quiz, Sports, Policies and Schemes of government, Census reports, Election results, Religious Census report, Economic indicators, Art forms, National Days, new Appointments, list of Union Cabinet Ministers, GK, Awards, Books, Cinema, Sports, etc. This book comes with exclusive one year access to the new manorama yearbook online www.manoramayearbook.in for the current affairs update on daily basis. This will very helpful to the students who prepare for competitive examinations like Central and State government examinations. 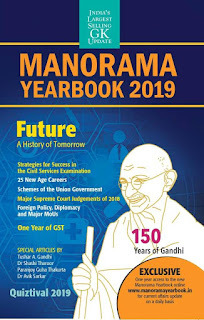 CLICK HERE to Buy Manorama Yearbook 2019 First Edition (English, Paperback) by Tushar A. Gandhi, Shashi Tharoor, Paranjoy Guha Thakurta, Avik Sarkar with special offers and Options with Cash On Delivery and 10 Days Replacement Guarantee.